A showpiece University building has won a prestigious Royal Institution of Chartered Surveyors (RICS) regional award. University Secretary Morgan McClintock, with Hugh Avison of CPMG Architects receiving the award from BBC News Breakfast presenter Bill Turnbull and Phil Dodd, from Sika Sarnafil. Centuria South, which was officially opened last October by Her Royal Highness The Princess Royal, was named winner of the Design and Innovation category of the RICS North East Renaissance Awards. The building, which has a state-of-the-art hydrotherapy pool for use by sport therapy students and a dental education and practice facility, was also shortlisted in the categories for sustainability and community benefit. 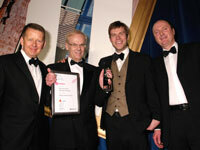 The winners were announced at the RICS North East Renaissance Awards ceremony, held at Newcastle Civic Centre. The property Oscars Known as the region’s property ‘Oscars’, the awards celebrate the most inspirational regional initiatives and developments in land, property, construction and the environment. Eighty-two entries were submitted from across the region with nominations ranging from small scale schemes, through to multi-million pound developments. The judging panel assessed all aspects of the buildings and initiatives entered, from design and planning to construction and the look and feel of the finished product. The judges visited the University campus in March. Entries were split into eight categories – commercial, residential, design and innovation, regeneration, sustainability, community benefit, tourism and leisure and building conservation. Teesside University's Centuria South building was awarded the Design and Innovation prize at the North-East Royal Institution of Chartered Surveyors Renaissance Awards. Teesside University's Centuria South building was named winner of the Design and Innovation category of the RICS North East Renaissance Awards.